Many thanks to everyone who turned out last Sunday for our Pub Quiz at the Young Pretender. 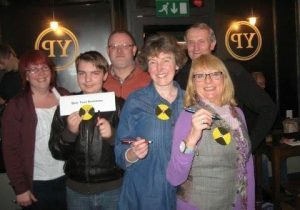 The winning team was the Quiz Test Dummies (pictured) – each of whom received an engraved Congleton Museum pen. Nearly £300 was raised for the museum!